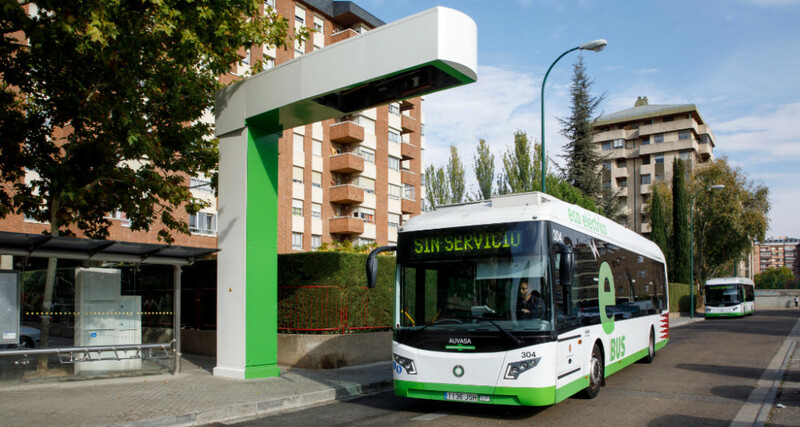 By placing the Opbrid Bůsbaar fast charging station at one or both ends of a bus route, a hybrid or electric bus can run all day on electricity, charged each time it reaches the end of its route. Charging during the day allows the use of smaller, lighter, less expensive batteries than buses that only charge at night. This means less battery cost, less weight, and more room inside the bus. Or, a hybrid bus can be converted to fully electrical running, yet keeping the advantage of a backup diesel generator. Besides the long term benefits of less weight and more room, the initial added cost of the Opbrid Bůsbaar per bus is more than offset by the reduction in batteries. The Bůsbaar roadside charger can be shared by up to 8 buses, making the cost per bus of the charging station very low. The Opbrid Bůsbaar All-in-One Opportunity Charger integrates all charging electronics into the vertical mast for a remarkably small total footprint, giving more room for pedestrians and cyclists. Since no space is necessary for a large “electronics box”, planning and installation are much easier. The clean Swiss design fits easily into any city, and saves money due to its advanced power electronics and modular design. High quality components and good serviceability ensure trouble free and profitable operation. Our long association with Furrer+Frey in Switzerland has resulted in a simple but very robust inverted pantograph design for the curbside charging station. Its modular design lends itself to many different aesthetic possibilities to blend in with existing street furniture. The communication and control electronics that tie the whole system together are developed by Opbrid. We maintain 100% compatibility with the OppCharge industry standard and the relevant IEC and ISO standards. Our goal is to provide standards compliant curbside charging stations where you can be assured that any OppCharge compatible bus or truck can charge. From our work with Volvo in Gothenburg. we offer charging stations that are compatible with the latest OppCharge standard for Electric Hybrid and full electric buses. The OppCharge ACS consists of two parallel copper bars on the roof of the bus, that mate with two copper bars that drop down from the charging station and intersect perpendicularly. This system has a total of 4 contacts; positive, negative, earth and pilot. Our Opbrid designed communication system is based on a wireless version of the ISO/IEC 15118 communication that is the same used by BMW, VW, Mercedes and GM in their cars.